You are here: Home » GENRE » Science » Bird-bot will conquer the world (first, they came for the warehouse workers). 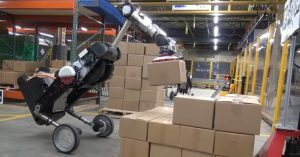 Robot developer Boston Dynamics has given up for the moment on scary evil pony robots that can do Kung-fu moves and moved into the more prosaic world of coming up with robots to replace humanity in manual jobs – starting with this Big Bird-like pecking mother of a warehouse bot. Handle is a robot that combines the rough-terrain capability of legs with the efficiency of wheels. It uses many of the same principles for dynamics, balance, and mobile manipulation​ found in the quadruped and biped robots we build, but with only 10 actuated joints, it is significantly less complex. Wheels are fast and efficient on flat surfaces while legs can go almost anywhere: by combining wheels and legs, Handle has the best of both worlds. Handle can pick up heavy loads while occupying a small footprint, allowing it to manoeuvre in tight spaces. All of Handle’s joints are coordinated to deliver high-performance mobile manipulation. « Do human-alien hybrids walk among us?